Elections in Spain: Is It Finally Time for a Coalition Government? The Spanish exception has ended. With the arrival of VOX into the scene Spain will join its neighbours in having an ultra-right-wing party in the Parliament. This circumstance will be confirmed on April 28 when the country will go to the polls to vote for a new Government. The current one, led by the socialist Pedro Sánchez, lasted less than a year, a record in modern Spanish history. 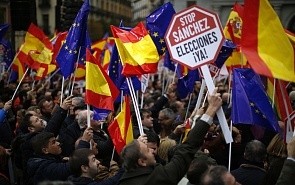 Sanchez arrived to power thanks to the votes of the Catalan independentists, who supported his motion of no confidence against his centre-right rival Mariano Rajoy, who was weakened after several corruption scandals in the PP party, and the same independentists were also the ones who brought him down by voting against Sanchez’ 2019 budget. Unfortunately, the rise of VOX and the fall of Sanchez demonstrate that the most contentious issue in Spanish politics remains the Catalan crisis. Sanchez tried for months to have a more compromising attitude vis-à-vis the Catalan independentists. His main slogan was that dialogue is better than confrontation. But his tactical moves run against a wall once the independentists started to demand the start of negotiations to celebrate a referendum of self-determination in Catalonia in exchange for supporting the Government’s budget. Of course, Sánchez, despite his good intentions of finding a solution to the Catalan conundrum, could not accept this blackmail. Among other things, because there is no mandate by the Spanish people to negotiate such a referendum. The whole dialogue was therefore a charade. The big winner, however, of this process was VOX who used the situation to convince many people that Sánchez was about to sell out Catalonia to the independentists. This and the fear of illegal immigration made it gain just over 10% of the vote in the recently celebrated regional elections in Andalucia, which is perhaps with Madrid the region most aggravated by the attempt of unilateral declaration of independence in Catalonia in October 2017. VOX is likely to get a similar or better result on April 28. We should not forget that at this very moment and in the months to follow the trial against the independentist leaders (with the exception of those who fled) is taking place, and that VOX is the only plaintiff accusing the Catalan leaders alongside the state prosecutor, increasing its appeal among those Spaniards who want to see a hard line approach against those who they see as national traitors. We are witnessing the start of a new election cycle in Spain, an aggravation of the internal political conflict and a rather pessimistic scenario for the PSOE’s results at the upcoming general parliamentary elections. The emergence of VOX then will divide the Spanish parliament in five parties with more than 10% of the vote (the PP, PSOE, Podemos, Ciudadanos and VOX) plus the regionalist/independentists parties. Quite a “dutchification” (fragmentation) of Spanish politics. The polls show that the most likely outcome is a three-party agreement on the right between the PP, Cs and VOX, as happened in Andalucia, but this is to be seen. The arrival of VOX might mobilise the left, to the point that many Podemos voters might vote socialist to concentrate the vote in one leftist party. It might also be that the three parties on the right might not have an absolute majority (such is the fragmentation) or that Ciudadanos might not be willing to pact with VOX given that neither the liberal minded FDP in Germany nor Macron in France (the allies of Ciudadanos in Europe) would ever contemplate reach power with the votes of the AFD or the party of Le Pen. Ciudadanos might even pact with PSOE even though they have recently said that this is impossible. But they said the same about Rajoy before the previous elections and then they backed him anyway. Hence, it is very difficult to know what will happen in Spain after the April 28. However, what is very likely is that if there is a government (a big if) it will be a one formed by a coalition government. This would be the first time in the history of modern Spanish democracy at the national level, and it might start a new era of more dialogue and compromise, which would be positive. What is also likely is that the turnout for the European elections in Spain on May 26 might be quite low. This is always bad, but the silver lining is that presumably most of the VOX voters will not be as motivated to come out so the centrist parties will have bigger shares of the vote and therefore Spain will also have more of its representatives in the larger political blocs in the European Parliament. This would also be positive for Spain.